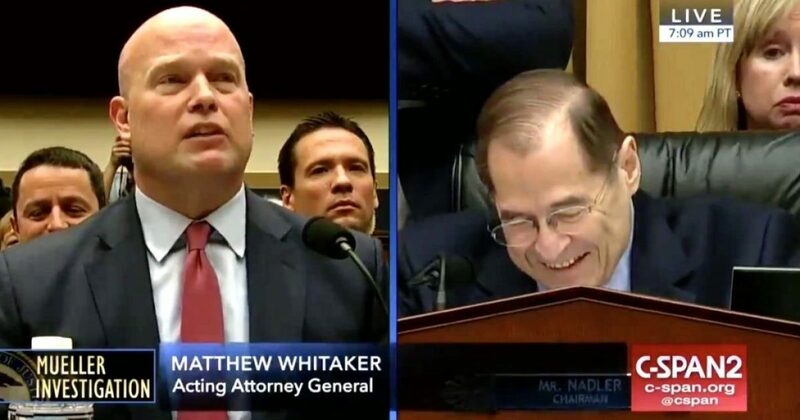 Acting Attorney General Matthew Whitaker appeared before the House Judiciary Committee Friday for the express purpose of participating in a Democrat-engineered assault on the President of the United States. Whitaker was questioned repeatedly about whether President Trump requested him to interfere in the Mueller investigation. Even though Whitaker answered the question in the negative every time it was asked, it was asked again, over and over, repeatedly, in slightly different language, but always with the intent of painting a picture of Whitaker and President Trump conspiring to end the Mueller inquisition. Whitaker wasn’t playing and handled the circus like a boss. Despite freshman congressmen and women putting on their best foaming at the mouth performances of the most righteous indignation and being spoken to as though he, himself, were a condemned criminal, Whitaker calmly answered their questions. When Chairman Nadler questioned Whitaker, again about his role in trying to stop the Mueller investigation, Whitaker calmly informed the chairman, invoking the five-minute rule that Nadler himself had established, that his five minutes were up, which caused the room to erupt in laughter. RT kylegriffin1: Jerry Nadler asks Matthew Whitaker if he has ever been asked to approve any request or action to be taken by the Special Counsel. Whitaker: "Mr. Chairman, I see that your five minutes is up." Too much fun! Nadler certainly looked buffoonish along with the redt of the Dems. Can we start calling them Socialists (or even Communists) now. Truth in advertising. I really wish Whitaker was staying on full-time as AG. He looks like he eats swamp rats for breakfast! Whitaker should take Rosenstein's job when Rosenstein goes to jail. Yeah, I wish he was the AG. If the new guy has half the balls Whitaker has, some Dems are going to jail where they belong.